I have blogged for a year. Sorry, I got distracted, blame the exhaustion. Being introduced to the world of bloggers was life changing. It's one of those things that you can't imagine what you did without. But really, some folks who share their lives online are brilliant. I honestly believe that I live my life better because of these people. I'm inspired daily by the blogs I read. I'm also inspired to experience more because I can't wait to share. Most importantly though, it's given me the kick in the pants I needed to document more. Jeff and I used to be the type that would come home from a vacation with 2 pictures. Now I'm battling with the "not enough storage" messages on my devices due to the abundance of shots. Thanks to everyone who reads this little outlet of mine. Thanks especially to those who comment and follow. On another note, we spent time outside today you guys. 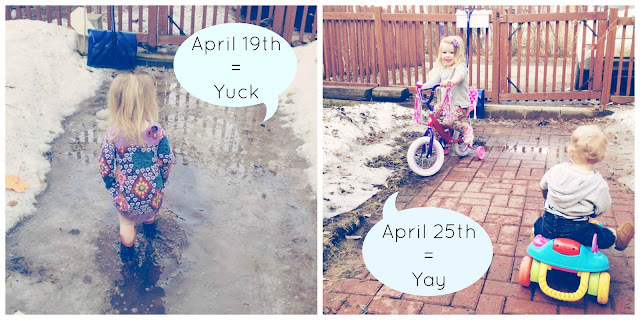 Our backyard is no longer a lake and the bike made the big move to the great outdoors. Congratulations and Happy 1st blog birthday, Cheryl! Thanks Dajana! The feeling is mutual! Congratulations on being a year old!!! It's so true about the blogging world isn't it? I can't imagine my life without it! Glad the lake is gone! Hooray spring!